March 2010 sees the launch of new Techne thermal cyclers. The feature-packed TC-PLUS can be combined with Satellite units giving complete flexibility to configure any multi-block format. The new thermal cyclers have one of the fastest aluminium blocks on the market, delivering greater uniformity than a silver block and therefore more reproducible PCR results. The 5.7 inch VGA colour touchscreen with graphical display is intuitive and easy to use. All buttons are large enough for fingers - so no stylus, pen or spatula needed! The TC-PLUS features a unique CD-type sample drawer. The force used to push the drawer in also lowers the heated lid into position, applying the correct pressure onto the samples to prevent evaporation. This mechanism is entirely mechanical and doesn't rely on motors. All consumable types can be accommodated, from 0.5ml tubes to 384-well plates, sealed with either heat or adhesive seals. 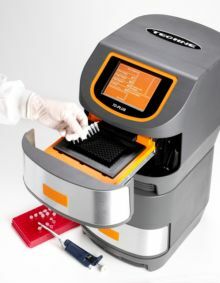 The stackable design and PC software enable multiple TC-PLUS cyclers and Satellites to be networked, for high throughput PCR, using 96-well or 384-well blocks. Satellite units can be controlled from the TC-PLUS server or a PC but have no user interface. The next generation PC software can be used with all current and previous generation Techne thermal cyclers. There is a choice of easily interchangeable blocks - 96 x 0.2ml, 60 x 0.5ml and 384-well plate - all with gradient for efficient optimisation of PCR conditions. With over 20 years' experience in the design and manufacture of thermal cyclers, Techne is established as a leading supplier and the TC-PLUS is covered by a 4-year warranty (4 years or 100,000 cycles for blocks).